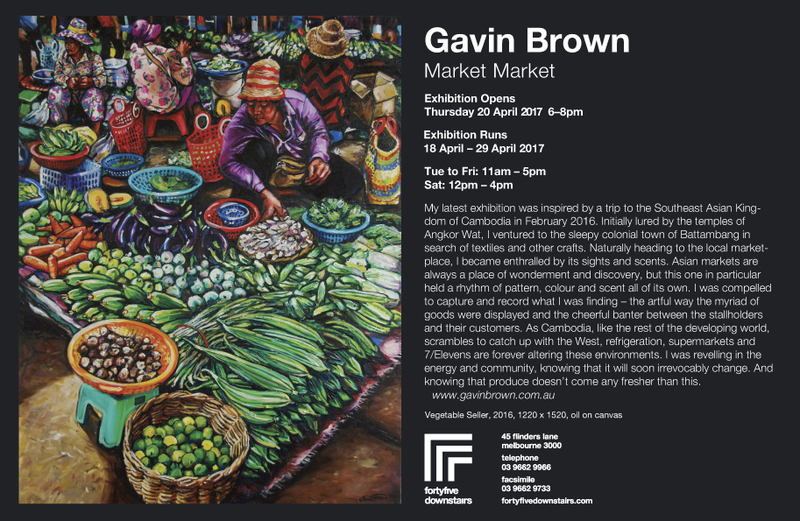 My latest exhibition was inspired by a trip to the Southeast Asian Kingdom of Cambodia in February 2016. Initially lured by the temples of Angkor Wat, I ventured to the sleepy colonial town of Battambang in search of textiles and other crafts. Naturally heading to the local marketplace, I became enthralled by its sights and scents. Asian markets are always a place of wonderment and discovery, but this one in particular held a rhythm of pattern, colour and scent all of its own. I was compelled to capture and record what I was finding – the artful way the myriad of goods were displayed and the cheerful banter between the stallholders and their customers. As Cambodia, like the rest of the developing world, scrambles to catch up with the West, refrigeration, supermarkets and 7/Elevens are forever altering these environments. I was revelling in the energy and community, knowing that it will soon irrevocably change. And knowing that produce doesn’t come any fresher than this.